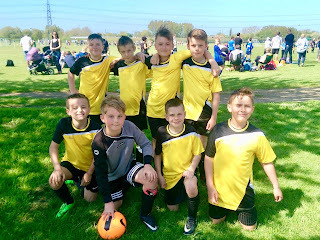 In our first game we were unfortunate to lose 2 - 0 against Walkwood, who went on to win the entire competition. Next we were beaten 3 - 0 by Swanland, 4 - 0 by St James and 3 - 0 by Codsall. Our final game was the closest of the day as we lost 1 - 0 against Sacred Heart. Although results did not go our way nobody gave up and we showed great determination throughout. With six of the team being able to play in next year's competition it is hoped we can learn from the experience and come back stronger next season. Codsall and Walkwood from group A, together with West Bridgford and Whitchurch from group B went through to the semi-finals. West Bridgford defeated Codsall on penalties whilst Walkwood beat Whitchurch. In the final it was Walkwood 1 West Bridgford 1 at the end of normal time, with Walkwood winning the penalty shootout.